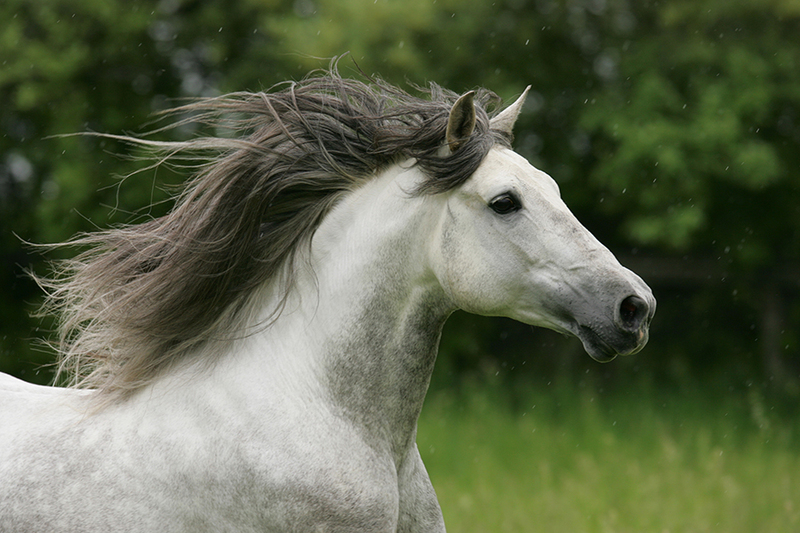 Majo KG is what most people think of when they visualize an Andalusian – powerful, round, beautiful, brave, kind, athletic with abundant mane and tail. As the grandson of two National Champion Senior Stallions, Majo’s beauty and athletic ability is genetic. While watching Majo loose in the field, or being worked, one can understand how the Andalusian was so valuable as a warhorse and in the bullring. Majo has the ability to effortlessly float laterally, from side to side, then sprint forward or spin in the other direction. From his great sire, Majorio II (one of the few Andalusians to tour with the “Royal Lipizzan Stallion Show”), Majo has inherited his potential for “airs above the ground”. While in the pasture, he plays at high school movements. Majo has been evaluated by 3 FEI level trainers as having Grand Prix potential. The famous author, clinician and trainer, Paul Belasik praised Majo KG during one of his clinics in 2008. Mr. Belasik told the audience that working with Majo KG made him want to keep his own 3 year old stud colt. Majo reminded him how enjoyable it was to work with a talented Andalusian. Riding Majo is like riding a Ferrari. Responsive (versus “sensitive”), Majo almost responds to his rider’s very thought. He is careful with amateur riders and more expressive with advanced riders. Majo is an excellent example of the classic Andalusian temperament. Majo is passing his classic looks, conformation, athletic talent, temperament and brilliance to his foals, Purebred and Half Andalusian.